There are 3 broad types of guitar tuner. These all work in different ways to help you to tune your guitar. Within those 3 types there are of course different brands and different display types. 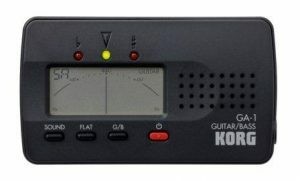 The type of guitar tuner you go for will depend on your budget and your purposes – e.g. if you are playing in a band or group or only by yourself and whether you use alternate tunings or not. Who Should Use a Tuner? 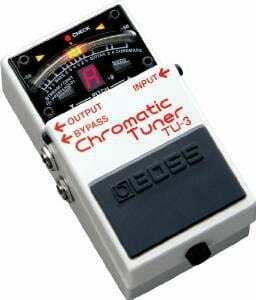 A tuner is particularly important for anyone who plays live, in a group setting or who records. It is also particularly important to beginners. A beginner may not have yet perfected tuning by ear so a tuner is a great way to make sure you are always in tune. It’s extremely important for a beginner to be in tune. This is because if you are playing something and it doesn’t sound right you need to know that it is something that you need to correct in what you are plating, rather than it not sounding right because the guitar is out of tune. If you are forever unsure what is causing the music to sound wrong your learning process will be slow and frustrating. If you are not yet completely confident with tuning by ear then a tuner is a must. What Type of Tuner is Right for You? Essentially, in my opinion you want to get a chromatic tuner unless you are on a really tight budget and don’t need the functions of a chromatic tuner. A non-chromatic tuner only has capabilities of recognizing the notes of the guitar for standard tuning. So it will only be able to tune EADGBE. These are often cheaper due to their limited capabilities. So if you think you will only be playing in standard tunings (at least for now) and you are on a tight budget a non-chromatic tuner might be your best bet. Just know that if you venture into alternate tunings at a later date you will have to invest in a new tuner or tune by ear. Chromatic tuners will pick up the note that you are playing on the guitar and show how sharp or flat you are relative to the nearest semi-tone. Chromatic tuners can get you in tune for any alternate tunings you need. On average they are more costly than non-chromatic tuners but well worth the extra investment in my opinion. If you are a beginner and still clueless as to how to tune – even with a tuner – or you could use some clarification on tuning check out the link below. That page takes you through step by step in plain English how to tune (both by ear and using a tuner). As well as chromatic and non-chromatic you can also get a few different types. The right tuner for you will depend on your needs and your budget. 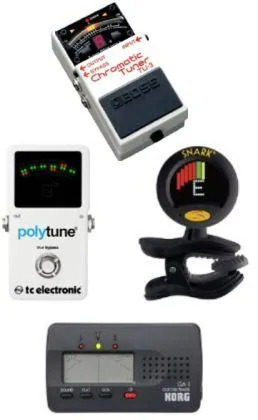 Standard tuners tend to come in a small rectangular box shape and have a microphone to pick up sound and also an input jack where you can plug-in electric-acoustics or electric guitars. They often (not always) come with extra features like a metronome. When using with the microphone these can be inaccurate when there are other sounds around you and can get a bit frustrating. Clip on tuners work by picking up the vibrations from your strings. They are usually clipped onto the headstock. Pedal tuners are great for those who are playing electric acoustic and electric guitars, especially for those who don’t want to have to muck around plugging in and unplugging, or clipping on and unclipping their tuner. It is the best choice for playing gigs. 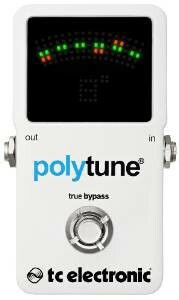 Polyphonic tuners are able to detect all of the strings at once and locate which ones are out of tune. This speeds up the process of tuning the guitar. They most commonly come as pedal tuners but also come as standard tuners. I haven’t seen any polyphonic clip on tuners as yet. Thanks for reading and I hope this has helped you decide on which tuner is best suited to your purposes. Let me know if you have any questions or comments in the comments sections below. Thanks for this info! 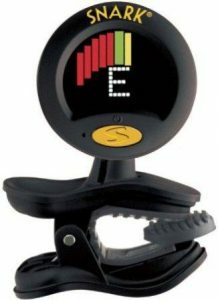 As a beginning guitarist myself, a tuner has become essential. I did not realize there were so many choices. Thanks for stopping by. Yeah heaps of tuners these days. When I started playing guitar you could only get the standard tuners and pedal tuners. Hey Keye. You’re welcome. Yeah it’s good to know all the tuner types so you can tell which is best for your purposes. Thanks for vsiting.